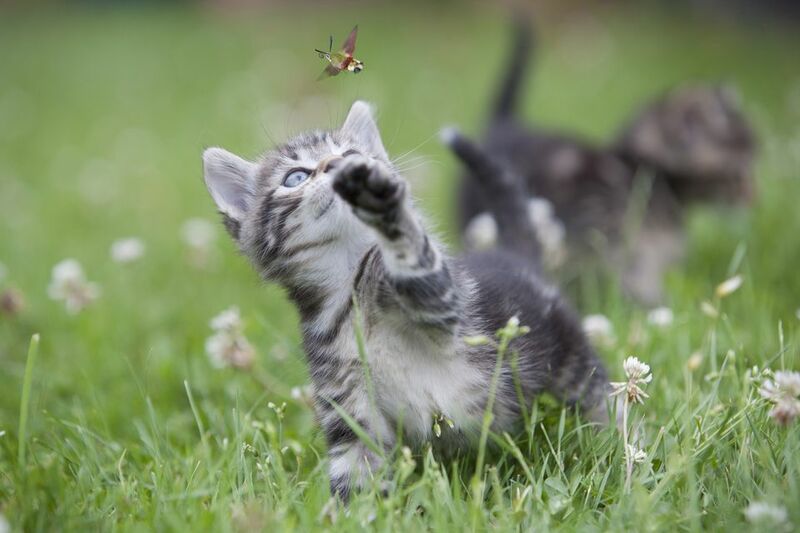 Does your cat love to chase and play with bugs? Maybe even eat them from time-to-time? Cats are natural hunters that enjoy pursuing prey. Evolution has provided cats with an acute sense of hearing and vision that is hard-wired to detect motion. Even the slightest sight or sound that indicates the presence of prey can make a cat jump into hunter mode. This is why bugs are so fun to chase and play with for them. Many common insects are harmless to cats, but some can be poisonous or cause injury. Some insects are more dangerous than others. Even non-poisonous bugs can cause vomiting ​or other gastrointestinal issues if too many are consumed. Others have non-toxic stings or bitter tastes that can cause a cat to drool, vomit, or experience pain. In many cases, the pesticides used to control insect problems are more harmful than the insect itself. If you use chemicals for pest control, make sure they are safe for pets. As a loving cat owner, take the time to educate yourself about the risks of different insects. If you see your cat has eaten all or part of an insect, you will know how to handle it. Of course, when in doubt, you should contact your veterinarian. Most spiders, especially small house spiders, are generally harmless to cats. However, any poisonous spider that can harm people can also harm your cat. Because your cat is much smaller than you, venom from a spider bite can do more damage to them than it could to you. The more common poisonous spiders to watch out for include the Black Widow (and other such widows/hourglass spiders), Brown Recluse, White Tail, and Hobo Spider. Poisonous spider bites can cause major illness or even death. Some bites cause localized reactions that turn into major wounds. Others, like that of the Black Widow, cause paralysis, drunken gait, and respiratory issues. If you suspect your cat has been bitten by a poisonous spider, get to the veterinarian right away. If your cat ingests a spider, the venom is unlikely to be a problem, as the stomach acids tend to counteract the venom. However, you should still observe your cat closely for a day or two in case any signs of illness appear. Flying, buzzing insects are very tempting for playful cats. However, their stings can be painful. As in humans, it is possible for a cat to have an allergic reaction to a sting and experience anaphylaxis, though this is uncommon. It is more likely that the cat will lick at the site where she was stung and further irritate the area. If your cat was stung by a bee, your vet may advise giving diphenhydramine, an anti-histamine. It's a good idea to keep this on hand, but do not give it unless advised to do so by a veterinarian. If your cat experiences a strong reaction to the sting, it's best to go to the vet immediately. Most moths and butterflies pose no risk to cats. This is fortunate since cats really enjoy pursuing these fancy fliers. Some caterpillars will sting, causing pain to your cat. The stings from common caterpillars are rarely dangerous, but some large, exotic caterpillars can be toxic. The Garden Tiger Moth, pictured above, may be poisonous if ingested (as well as the caterpillar). However, little is known about the toxic effects on cats. If you are trying to keep clothes moths away, your best bet is to use cedar. Mothballs are very poisonous to cats. Eating just one mothball can cause toxicity. That's because mothballs are really just solid, concentrated pesticide. Signs of mothball toxicity include vomiting, lethargy, weakness, breathing trouble, tremors, and seizures. Small house centipedes are generally harmless to cats. You might be relieved to find your cat ridding your home of these creepy crawlers. However, centipedes have venom and can bite to capture prey. Larger centipedes may be able to bit your cat. This could lead to a localized reaction or more serious issues like fever and weakness. If you suspect your cat has been bitten by a centipede, be sure to watch the area closely. You may need to go to the veterinarian if your ​cat shows any signs of illness. The Giant Redheaded Centipede (pictured above) and the Texas Redheaded Centipede can be very toxic or even deadly. Fortunately, these are unlikely to be found in your home. 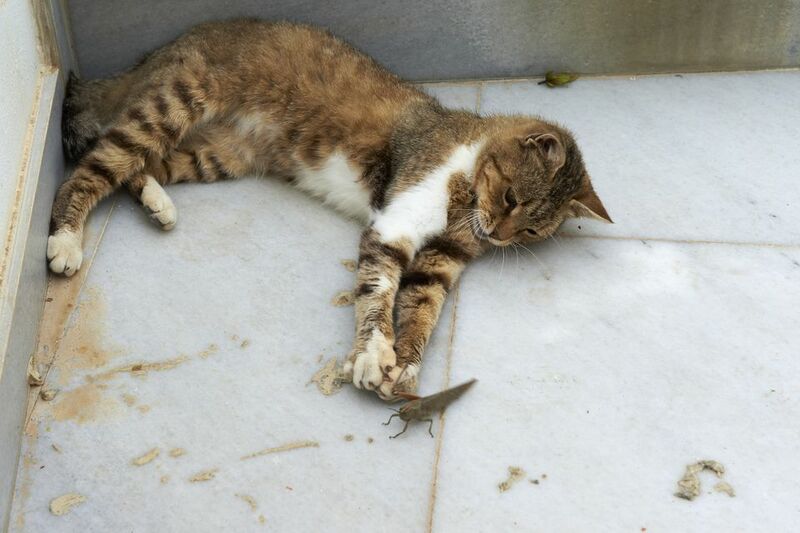 If your cat plays with a scorpion, she is likely to be stung. At the very least, a​ scorpion sting will be painful for your cat. It will likely cause a localized reaction. In more serious cases, cats can develop vomiting, trouble breathing, or other unusual behavior. This is something to be especially aware of if you're a resident in Arizona. If you know you live in an area where scorpions are prevalent, be aware of the risk to your cat. If you think your cat has been stung by a scorpion, it's best to go to the veterinarian. Most ants are harmless to cats. Large black ants may bite cats, but these tiny bites cause no harm. Fire ants, on the other hand, can be very dangerous to cats. Their venomous bites are painful and can even cause a serious allergic reaction, the worst of which can lead to anaphylaxis. If your cat has been bitten by fire ants, it's best to visit the vet just in case. Note that chemical ant killers can pose a significant health risk to cats. The poisons can lead to serious issues for cats. Be sure to use pet-safe products. Hard-bodied insects like roaches, beetles, crickets, and grasshoppers are typically non-toxic to cats. However, ingesting their exoskeletons can cause oral irritation and gastrointestinal upset. Roaches may carry parasites that can affect cats. This is even more reason to keep your cat on a monthly preventive product that deworms. Fleas are very common in cats and can cause itchiness and even anemia. Cats often ingest fleas while grooming, which can cause a tapeworm infection. Monthly flea control products are important to avoid these issues. Ticks are more likely to appear on cats that go outdoors, but any cat can get ticks. The danger of ticks is the fact that they are vectors for disease. Tick-borne illness can cause a host of problems in cats. If you see ticks on your cat, talk to your vet about the best option for tick prevention. Mosquitos are mainly a nuisance to us, but they can transmit fatal heartworm disease to cats. Because cats are not ideal hosts for the heartworm, infection is uncommon. However, when a cat does get heartworm disease, the worms take up residence in the lungs. There is no treatment available for heartworms in cats. That's why monthly heartworm prevention is recommended. Flies may be fun for cats to catch, but they can also be a problem. Some cats are susceptible to fly bites on their ears, especially cats that live outdoors. When cats have fly bites on their ears, a fly repellant cream may be used to deter the flies. The cuterebra, or botfly, is known to lay its eggs on the skin of animals. The larva burrows under the skin and matures. When this happens in cats, it looks like a small lump under the skin topped with a tiny, perfectly round hole. As it matures, you may be able to see the larva, which looks like a large maggot. If you notice this in your cat, do not attempt to remove the maggot. Visit the vet so it can be properly removed and your cat treated for a secondary infection.